Satellite virus: The virus does not encode for a capsid and needs a helper virus for encapsidation and aphid transmission. 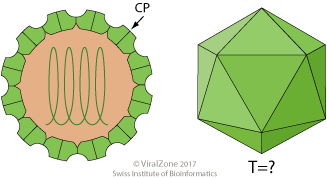 Infection requires host cell to be co-infected with a virus from the genus Panicovirus, family Tombusviridae. Linear, ssRNA(+) genome of 0.8 kb, which lacks a cap structure and a poly(A)tail. ETYMOLOGY Papanivirus: from panicovirus (helper virus), and the host panicum..